Our roots go back to 1878 with Herbert W. Johnson, who operated the Johnson Seed Co., in Moorsetown, New Jersey. 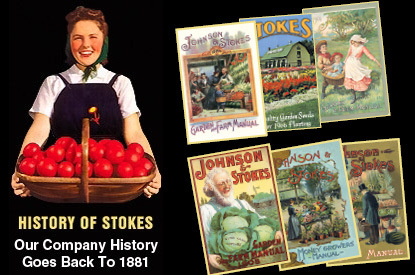 In 1881 Walter P. Stokes joined Johnson as a partner in the Johnson and Stokes Company, which supplied vegetable seeds to commercial growers in the New Jersey, and Eastern Pennsylvania regions. Johnson and Stokes parted ways in 1906 and Walter Stokes started Stokes Seed Farms, located at Windermoor Farm, near Moorstown, New Jersey. In 1916 the firm was taken over by Walter's son, Francis C. Stokes, a Rutgers horticultural alumnus, with a national reputation as a dynamic young seedsman who was responsible for developing some of the famous New Jersey tomatoes of the early 1900's (Stokesdale, Stokesdale #4, and improved selections of BonnyBest and Geneva John Baer). Francis was responsible for many "firsts" in the seed industry at that time. He was the first seedsman to offer seeds in a tin can, first to protect seeds with a fungicide, first to publish a color litho seed catalog and first to import and catalog Broccoli (from Italy) for his commercial customers. Recently, the American Vegetable Grower magazine published a copy of a Stokes ad dated in the 1920's to celebrate their 50th Anniversary. During the 1920's the Company recruited 5 or 6 salesmen, who quickly made Stokes the third largest seed company in the Florida/Texas/New Jersey area. Mr. Stokes believed in extensive trial gardens to test all types of species as well as compare the quality of stocks received and competitive strains from all over the world. One of the last salesmen to be hired was W. H. Gale, a young Canadian cauliflower grower. His territory was "all of Canada". supplied vegetable seeds to commercial growers in the New Jersey, Delmarva, and Eastern Pennsylvania regions. During the late 1930's and early 1940's the new Stokes Seeds company found that many of the vegetable varieties popular in the Carolina's, Florida, Delmarva, and Georgia were just too late for our Northeastern sales region. So close alliances were forged with European and Asian firms like Clause, Sluis en Groot, Tezier, Vilmorin, Sakata and Takii. Amercian suppliers like D. M. Ferry (later Ferry Morse), Asgrow, Northrup King, Hollar, Harris and Crookham were our leading suppliers in North America. Stokes pioneered the use of a temperature/humidity seed storage in 1936 (60°F/40% RH). As the Second World War threatened, several European seedsmen and Sakata (Japan) sent their valuable vegetable stock seed to Stokes seed storage for safe keeping. S & G and Stokes were instrumental in starting the California vegetable seed industry in 1940. After the war, we returned stock seed to all of our horticultural friends. During the Depression, the Stokes Seed Company of Moorsetown, N. J. fell on hard times. Mr. Stokes put the Canadian company up for sale in 1934, and it was bought by Mr. Gale, the Canadian salesman. In the 1950's Mr. Gale's son John, joined Stokes as a commercial salesman and worked closely with his father and the employees to focus the company's development along the same lines as the Harris Seed Company - elite O/P strains and new disease tolerant hybrid vegetables. Stokes returned to the U.S.A. in 1965, following Mr. Stokes death and located in Buffalo, New York with warehouses in Fredonia, New York. Harry Gale passed away in 1975 and the company was run by his two sons, then in 1980, John purchased the entire company and now has warehouses in Buffalo, NY and Vineland, NJ. In 1983, John's son Wayne joined the company and is now President. John who was very active as Chairman of the Board and author of the Stokes Seeds catalog for fifty years passed away April 23, 2017. He was highly regarded in the industry as a true seeds man. John could tell you all about Alyssum in one breath and the attributes of 50 different Broccoli in the next. His chats with staff and ability to spot great new products in the company farm trials will be missed.